With Rogers not yet letting the devices out the door and still only taking pre-orders, Best Buy in Canada should be raking in some of those sales for anyone interested in picking up either a HTC EVO 3D or LG Optimus 3D for Rogers. Best Buy now has both devices in store with pricing even cheaper then Rogers. 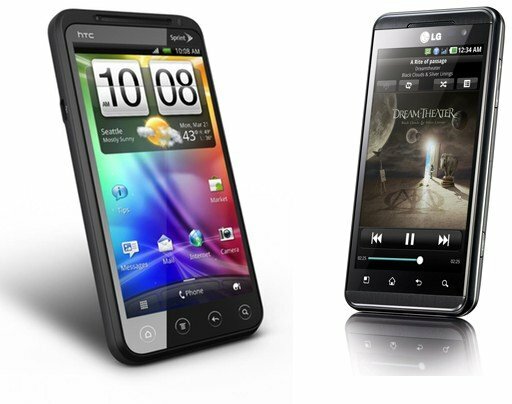 The HTC EVO 3D retails for $99 with a new three-year contract while the LG Optimus 3D retails for $49 under the same terms. (That's $50 cheaper then Rogers for either.) Anyone going to be grabbing either of these? (Burnaby, BC) August 3, 2011 – Best Buy Mobile, the mobile specialty retail unit of Best Buy Canada, announces the launch of the first 3D phones, the HTC EVO 3D and LG Optimus 3D, beginning today at all Best Buy and Best Buy Mobile locations. Both phones are available on the Rogers network. The HTC EVO and LG Optimus 3D phones let you watch 3D movies, play 3D games, and shoot 3D photos and videos all on the go and all without the need for 3D glasses. Both phones are 4G-enabled for ultra-fast connectivity and are equipped with a dual-core processor for serious multitasking. Best Buy customers can get help from Best Buy Mobile’s highly-trained, impartial staff of specialists, who can show customers how to use their new 3D smartphone before leaving the store. Best Buy offers free phone upgrade checks and full Walk Out Working Service to customers, which includes: transferring data from old phones to new phones setting up emails and pairing smartphones to Bluetooth devices, all for free! The HTC EVO 3D retails for $99 (save $50) on a 36-month plan and the LG Optimus 3D for $49 (save $50) on a 36-month plan – both on the Rogers network at Best Buy and Best Buy Mobile stores. For further information, visit: www.bestbuymobile.ca. Best Buy Mobile is the wireless retail unit of Best Buy Canada Ltd. offering the best selection of phones, carriers, and accessories, and run by impartial mobile specialists who help customers choose the phone that is right for them. In addition, the complimentary Walk-out-Working service ensures each customer leaves the store with their phone fully operational including free email setup on smartphones, free data transfer from your old phone to your new one, and free Bluetooth pairing to your new phone. Best Buy Mobile offers complete, end-to-end mobile solutions to enable users to discover and get the most out of their mobile experiences, regardless of what phone they use or what network it runs on. Look for your mobile phone solution at Best Buy Mobile locations in every Best Buy store across Canada as well as in standalone stores in select malls across the country. www.bestbuymobile.ca.